You’ve landed that big fish – acquiring a new major client that requires certain amounts of integration to your systems or you simply need to improve performance. An acquisition may be in the works – whether you are looking to expand via acquisition; be acquired or merge with another company, having up-to-date IT assets will help ease the transition. The company is ready to grow – perhaps the organization has reached a milestone and is ready to expand, either to new markets or geographic areas. The need for a solid IT infrastructure to accommodate expansion is incredibly important. An existing IT vendor folds – it’s sad, but can happen. Now, you have technology without support and are in need of a rapid change in order to ensure your organization is not adversely affected. You may find that you need to act quickly, and need to do something that does not negatively impact your budget. Where do you turn? Traditional sources are not always the most effective means to fund your IT needs. You need a source that is responsive and understands the nuances of acquiring new technology. Programs based on customer requirements – most organizations face the same business challenges that are not easily resolved with standard finance transactions. 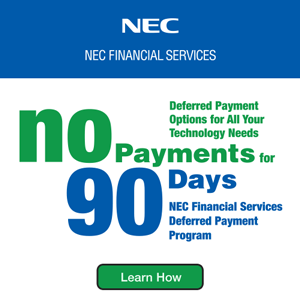 NEC Financial Services provides different types of programs based on customer requirements. From a purchase to own arrangement to an OPEX finance option, the program is designed to fit the business need. Off Balance Sheet – many organizations find it more attractive to acquire technology as an operational expense, giving them additional financial benefits. Driven by cash flow – if an organization has a specific budget amount they need to meet, NEC Financial Services will work to structure financing to accommodate that number. Our job would be to align the budget expense to the cost of that technology over time. For example, with a $10K budget a month – the goal would be to get that number to $10K or less. Beyond the traditional – NEC Financial Services designs financing options to ensure that clients can receive funding for their technology upgrades and investments, even during the installation or implementation phases. . Many times this can be accomplished through various offerings that include direct and working capital loans or structured financing. In addition to the financing options, NEC Financial Services also provides asset tracking. Salan also said that many clients have a need for protection against technology obsolescence. This is one of the drivers for determining the right finance solution and term. Salan and his team work through the whole corporate lifecycle, ensuring that the technology will grow to meet current and future needs. 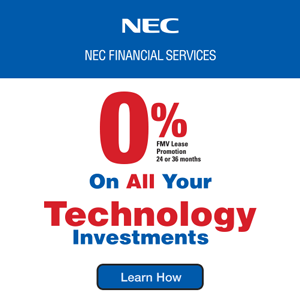 To learn how NEC Financial Services can provide technology financing on your terms, contact us today! Hey Buddy!, I found this information for you: "VoiceCon Recap from NEC". Here is the website link: http://nectoday.com/voicecon-recap-from-nec/. Thank you.